We first began to hear of the $1 Trillion Platinum Coin solution to the debt ceiling earlier this month from people like Joe Weisnethal at The Business Insider. Soon there was speculation from commentators at staid, reliable sources like The Economist, The Atlantic, and The New Yorker. The idea was that there was an obscure law that would effectively permit the Secretary of the Treasury to bypass the debt ceiling by minting its own money. Most of the discussion was about the legality of it all. It turned out that it was, in fact, legal. Now, if we still lived in a world of print journalism, the Platinum Coin solution might have remained an interesting idea. Not an idea to be taken seriously, however. Of course, in the world of instantaneous internet communication what really happened is that the Platinum Coin story went viral and all sorts of people, including Nobel Prize winning economist, Paul Krugman, were taking it very seriously. In fact, Krugman attacked comedian Jon Stewart for not taking the idea seriously followed by Stewart attacking Krugman for attacking him…. The whole farce ran its course when the Obama Administration was forced to state officially that it rejected the $1 Trillion Platinum coin solution. The roller coaster ride that was the “episode of the platinum coin” is instructive. Ideas are floated, commented upon, and either accepted or rejected before most of us have had a chance to digest them, let alone think deeply about them. And, who do we look to for reliable information: a Nobel Prize winning Economist, or a comedian, or any of the other “voices” available to us on-line? I did a Google search for “the trillion dollar solution” and got 88,700,00 results in .19 seconds. A search for “Platinum Coin Debt Ceiling” resulted in 74,700,00 hits in .25 seconds. What do I do with that information glut? Back in the days of the Progressive Era there were journalists who served as “muckrakers”, exposing social ills to the general public. If public outcry reached a critical mass, legislation would result. But, the process would take years. Today the outcry is practically instantaneous and policy makers are forced to rush to judgement. The Federal Reserve, several decades ago, authorized the printing a $100,000 bill with Woodrow Wilson on the face. This bill wasn’t meant for public consumption. Instead, it was used by the Federal Reserve to settle internal accounts among government agencies and its member banks. It sounds like the same idea as the Platinum coin, just a different denomination. I guess even the craziest ideas are not new. Idaho Governor Clement “Butch” Otter appears to have faced the fact of educational reform. The voters spoke and the Luna Laws lost. He hasn’t given up on educational reform, but he appears willing to go slower and try to include all interested parties in the discussion. He has asked the Idaho State Department of Education to form a group to determine if there is legislation that would have broad based support. If so, it would not be until 2014 that the legislature might consider such legislation. Here is part of Otter’s statement. After voters on November 6 rejected the process, pace and policies for improving Idaho’s education system enacted in 2011, it became the task of everyone who cares about the quality of Idaho public schools to constructively continue that conversation. My staff and I spent the next several weeks reaching out to educators, business leaders and Idaho citizens about staying engaged. Now that I’m optimistic we have a critical mass of interest, I’ve asked the State Board of Education to shepherd a statewide discussion about school improvement. I’m asking the Board to guide the work of a broadly representative group of concerned Idahoans in studying best practices in school districts around the state and using data and experience to drive sound decision making. The group is likely to be large, but only large enough to include the diversity of opinion needed to properly study such a complex issue. I’m not going to direct the discussion or the issues covered in any way. There must be no “third rail” in this conversation. But I am asking participants to come to the table ready to speak openly and candidly, and to bring ideas. I will not be prescriptive other than to say I remain committed to equal access to opportunity for our children and to increasing support for our educators. Should legislation be necessary for school improvement efforts I expect this group to build consensus around those ideas by the 2014 legislative session. It is imperative that our partners in the Legislature engage in this process and I am pleased to have the support of House Speaker Bedke and the Senate President Pro Tem Hill in balancing this fragile dynamic. Ira Glass of NPR’s Science Friday interviewed Dr Steven Novack, Physicist and Lead Researcher on the Solar Nanoantenna Project at the Idaho National Laboratory, today. Novack’s team has invented a new method to absorb solar energy that is much more efficient than traditional solar cells. The discussion was fascinating. If you didn’t get a chance to hear it, the podcast is worth downloading. Researchers have devised an inexpensive way to produce plastic sheets containing billions of nanoantennas that collect heat energy generated by the sun and other sources. The technology, developed at the U.S. Department of Energy’s Idaho National Laboratory, is the first step toward a solar energy collector that could be mass-produced on flexible materials. While methods to convert the energy into usable electricity still need to be developed, the sheets could one day be manufactured as lightweight “skins” that power everything from hybrid cars to iPods with higher efficiency than traditional solar cells. . . The nanoantennas also have the potential to act as cooling devices that draw waste heat from buildings or electronics without using electricity. The nanoantennas target mid-infrared rays, which the Earth continuously radiates as heat after absorbing energy from the sun during the day. 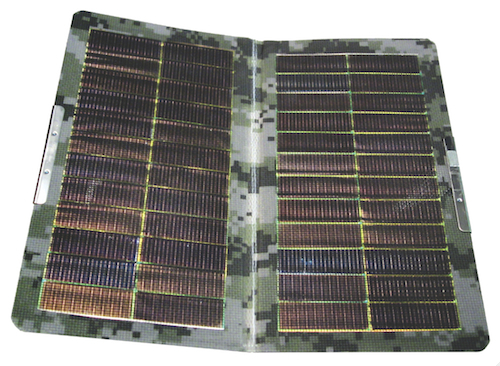 In contrast, traditional solar cells can only use visible light, rendering them idle after dark. Infrared radiation is an especially rich energy source because it also is generated by industrial processes such as coal-fired plants. The nanoantennas are tiny gold squares or spirals set in a specially treated form of polyethylene, a material used in plastic bags. While others have successfully invented antennas that collect energy from lower-frequency regions of the electromagnetic spectrum, such as microwaves, infrared rays have proven more elusive. Part of the reason is that materials’ properties change drastically at high-frequency wavelength. The researchers studied the behavior of various materials — including gold, manganese and copper — under infrared rays and used the resulting data to build computer models of nanoantennas. They found that with the right materials, shape and size, the simulated nanoantennas could harvest up to 92 percent of the energy at infrared wavelengths. The nanoantennas’ ability to absorb infrared radiation makes them promising cooling devices. Since objects give off heat as infrared rays, the nanoantennas could collect those rays and re-emit the energy at harmless wavelengths. Such a system could cool down buildings and computers without the external power source required by air-conditioners and fans. We own a Jeep Liberty and a first generation Toyota Prius. My wife commutes 50 miles a day, so she drives the Prius most of the time. It is a great car. It has over 50,000 trouble free miles with an average of 45-50 mpg. Of course, the obvious reason for the excellent gas mileage is because it is a hybrid. But, I have noticed an interesting phenomena that also impacts mileage. 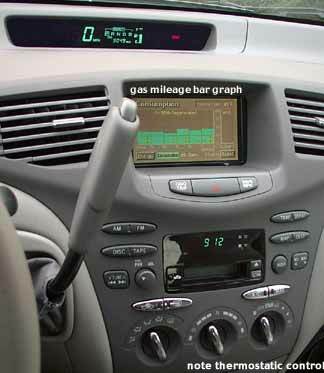 The Prius has a “gas mileage bar graph” display on the dash (see photo above). This provides the driver with immediate feedback as to past and current mpg. For me (and I am guessing for many Prius drivers), this immediate feedback causes a change in driving habits. I am always trying to maximize mileage and beat my previous “best.” Consequently, I use a number of techniques that cut down on fuel usage. When I drive the Jeep, I tend to forget these techniques and revert to my old ways. Gerdes has a fascinating discussion of the ways the average driver can become a hypermiler and the site is well worth a visit. Of course, I will never get 50 miles to the gallon from my jeep, but Gerdes claims a 30% increase is possible regardless of the vehicle. With the current price of gas, hypermiling makes sense. Next time you see a blue Jeep liberty coasting up to a stop sign, wave. It could be me at the wheel! First the iPhone and then the MacBook Air. Critics complained both lacked necessary features that made them more than mere toys. The Air was beautiful and all that, but without an optical drive, lots of ports, a large hard drive, etc., it isn’t really useful for serious work. If not, you should check them out. Free, on-line applications that come close to duplicating Microsoft Office Suite. This week, Adobe announced that it is offering a free on-line version of Photoshop Express. Not the full version of Photoshop, but great for quick photo editing and storage. Now you can take a photo with iPhone and immediately edit it with Photoshop Express. Storage on the Air or iPhone don’t seem to be a real issue anymore. 64g might be all a “serious” user needs. 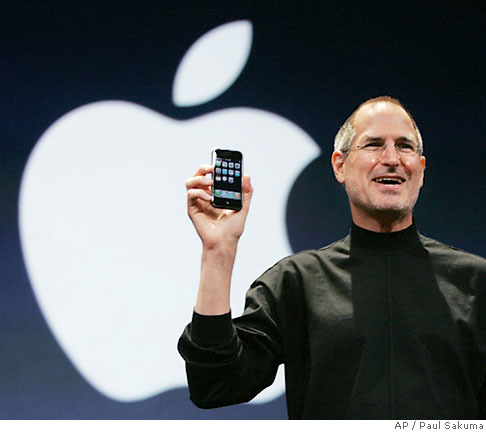 Can The Apple Logo Makes You More Creative? Look at the Apple logo to the left. Do you feel more creative? You should if you can believe a recent study by Duke University and the University of Waterloo, Canada. Researchers found that even brief exposure to established brands can cause people to inherit the behaviors championed by those brands. Professors Gavan Fitzsimons and Tanya Chartrand of Duke, and Grainne Fitzsimons of Waterloo, in an article published in the April issue of the Journal of Consumer Research, claim that a mere 30-millisecond exposure to famous brand logos can influence view behavior. This study reminded me of the claims of “subliminal advertising” during the 1960s. Advertisers flashed messages like “drink coke” or “eat popcorn” for just 1/3000 of a second during the screening of a movie. Supposedly, the “message” would not be recognized on a conscious level, but would cause a desire for the product on a subconscious level. Subliminal advertising was popularized in the book, The Hidden Persuaders, but the claims were later found to be fabricated. I have no problem with product logos making me more creative, but I am concerned if the “powers that be” decide to make us all more submissive and obedient. I wonder what brand logos might be able to do that?